Pope Benedict supports the "Occupy Wall Street 'Movement'"
Susan Sarandon, the new Mother Superior, explains she was recently misquoted as describing Pope Benedict as a "Nazi" when she really said he was a "National Socialist" even though in doing so she "misspoke" because she meant to say he is an "International Socialist." All people who truly seek to have Jesus in their hearts must not only watch this news-clip but must do so repeatedly until the thought process suggested in it becomes automatic and they find themselves perpetually searching for someone willing to purify them by taking their property from them.� We must eradicate the pernicious effects of Pope John Paul's attempt to worship the false religion that God endowed all humans with unalienable rights to enjoy the fruits of their own labor (a.k.a. 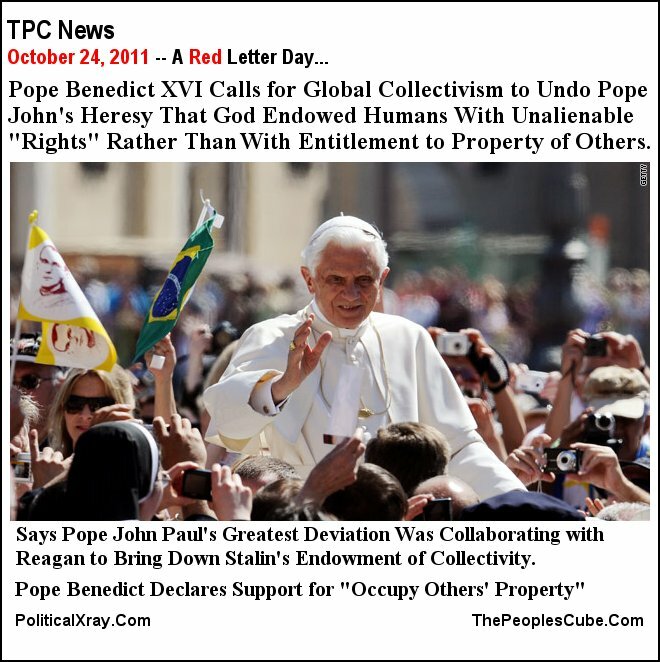 "property").�� We must also recognize the new Ultimate Mother Superior status of one of our leading theoreticians, Susan Sarandon, who only recently and quite presciently recognized Pope Benedict XVI's commitment to National Socialism (regarding which the Reich Wing media falsely reported that she called him a "Nazi").� She also clarified her statement by adding that she inadvertently said "National Socialism" when she meant to say "International Socialism." ����������� Sensing the universal popularity of whatever the Pope says among conservatives, Tea-Partiers and Republicans, President Obama quickly recalled one of the most memorable lines among the many sermons of Jeremiah Wright to which he listened intently for 20 years:� "Jeeeeeesssssuuuuus wants us all to be collectivists," and explained, "That's the reason for my Long March from capitAlism (via crony capitAlism) to CapitOlism." Occupy Wall Street in Long March to CapitOlism from PoliticalXray a.k.a. PoliSat.Com on Vimeo.